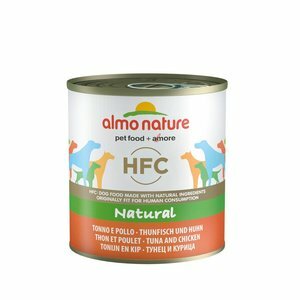 Unique natural wet dog food, prepared with 100% fresh chicken and fresh tuna without meat flour, dried meat nor flavor enhancers. This is wet dog food that consists of 100% ingredients that are suitable for human consumption. (HFC=Human Food Chain). It is therefore healthy and natural dog food of high quality and completely free of dyes and preservatives. The food is prepared with 100% fresh chicken and tuna. 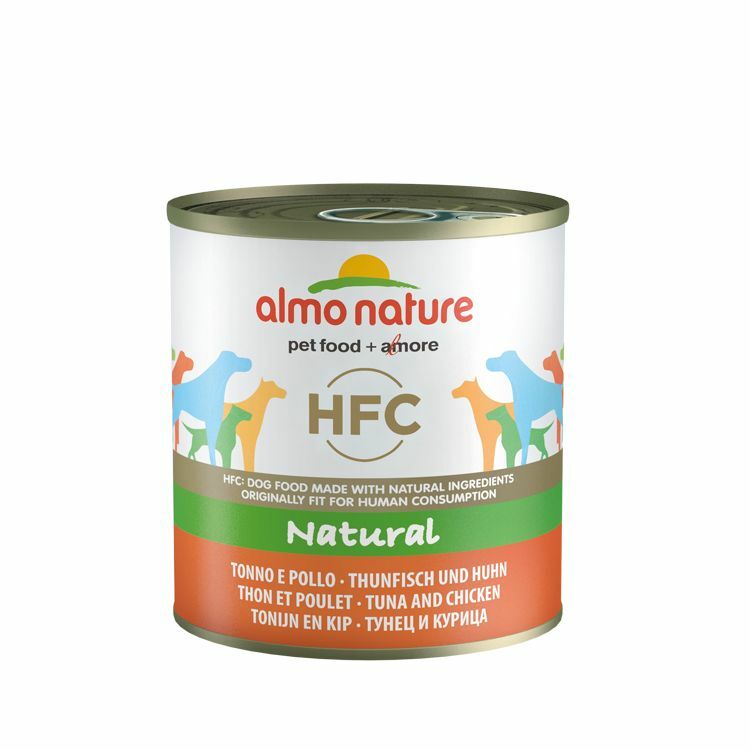 For a good balance in nutrition, Almo Nature recommends to feed the dog dailey a combination of wet food and dry food. NB. This is an indication. Each dog is different in terms of behavior, activities and food needs. Please ensure that the dog always has access to sufficient fresh and clean drinking water. Composition: Tuna 25%, Chicken 25%, Chicken broth 47%, Rice 3%. 12 cans, each can 290 grams. Please note that this product used to be called Classic, the new name is HFC. Some cans may still have the old label, but the contents are the same and have not been changed. Ik heb verschillende producten uit geprobeerd omdat de hond gevoelige darmen heeft. Maar dat is nu helemaal goed gekomen.